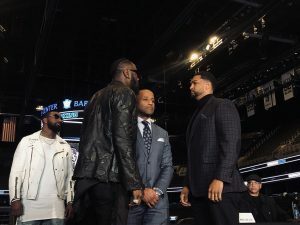 Undefeated WBC Heavyweight Champion Deontay “The Bronze Bomber” Wilder will put his title on the line for the ninth time when he steps into the ring against hard-hitting mandatory challenger Dominic “Trouble” Breazeale live on SHOWTIME and presented by Premier Boxing Champions on Saturday, May 18 from Barclays Center, the home of BROOKLYN BOXING™. Wilder (40-0-1, 39 KOs) is the most exciting heavyweight in the world with a power-punching style that has fans on the edge of their seats from start to finish, knowing the tide of a fight can change in the blink of an eye. He has only gone the distance twice in his career with 39 of his 41 matches ending inside of the distance. He battered Bermane Stiverne over 12 rounds to win a lopsided unanimous decision and claim the WBC title on Jan. 17, 2015. In the rematch two years later Wilder crushed Stiverne with a brutal first-round knockout that left the challenger crumpled on the bottom rope. The 33-year-old Wilder is coming off a thrilling battle with British heavyweight contender Tyson Fury that resulted in a split draw on Dec. 1. Wilder scored knockdowns in the ninth and 12th rounds of the fight. The last knockdown appeared to finish off Fury, but he beat the referee’s count and made it to the final bell. Born in and still living in Tuscaloosa, Alabama, Wilder picked up the nickname “The Bronze Bomber” in honor of Joe Louis, who was known as “The Brown Bomber” after he won the bronze medal as a member of the 2008 U.S. Olympic boxing team. Wilder got a late start as a boxer, taking up the sport at age 20 hoping to become a professional and earn enough money for the medical treatments of his daughter Naieya, who was born with spina bifida. He won the U.S. Olympic trials with just 21 amateur bouts under his belt. Breazeale (20-1, 18 KOs) is nicknamed “Trouble” and that’s exactly what he has been for his opponents. The 33-year-old has a durable chin and a slugger’s mentality, throwing heavy-handed shots that have seen him score 18 knockout victories in his 21 professional fights. Breazeale, who was born in Glendale, California and now lives in Eastvale, California, was an outstanding high school football player who played quarterback at Northern Colorado University before taking up boxing. The 6-foot-7 Breazeale was a member of the 2012 U.S. Olympic boxing team.